It is important to stress that not everyone experiences severe chest pain and some patients will not experience any pain at all. The pain can often be mistaken for indigestion. It is the combination of symptoms that is important is important in determining whether a person is having a heart attack, and not the severity of chest pain. Heart attacks can be very difficult to diagnose. The golden rule is that if you think someone is having a heart attack dial 999 immediately. Do not worry if you are having doubts or are uncertain. Paramedics would rather be called out to find that a mistake has been made rather than being too late to save a person’s life. Dial 999 immediately you think someone is having a heart attack. Do not delay making this 999 call. Sit the patient down in a comfortable position. Do not allow them to walk around as this will put a strain on the heart. If an aspirin (300mg) is easily available and the patient is not allergic to aspirins, ask them to slowly chew and then swallow it. The aspirin will help thin the patient’s blood and restore the blood supply to the heart muscle. If the patient becomes unconscious be prepared to carry out CPR and to use a defibrillator. A heart attack happens when there is a sudden loss of blood flow to a part of the heart muscle, usually as the result of a blood clot. Although the heart muscle will become damaged if the clot is not dissolved by drugs, the heart will carry on beating. 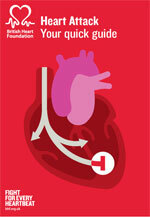 A cardiac arrest happens when a heart stops pumping blood around the body. If someone has suddenly collapsed, is not breathing normally and is unresponsive, they are in cardiac arrest. If you witness a cardiac arrest, you can increase the person’s chances of survival by dialling 999 immediately, giving CPR and using a defibrillator. Although a heart attack is different to a cardiac arrest, a person having a heart attack can go into cardiac arrest if their treatment is delayed. 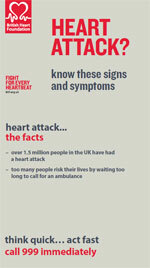 If you dial 999 as soon as you think someone is having a heart attack, it could prevent them going into cardiac arrest. The simple action of dialling 999 is all that might be needed to save a person’s life.